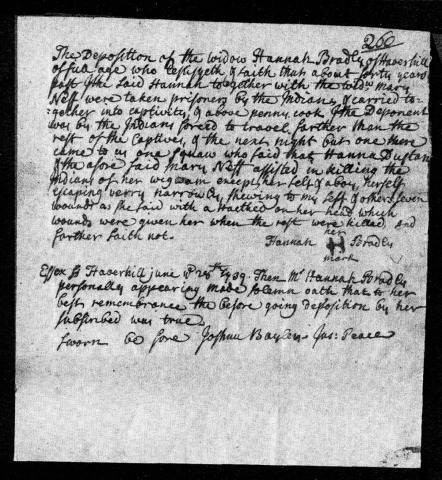 Deposition of Hannah Bradley of Haverhill, 1739. In this brief account Hannah Bradley of Haverhill, a captive in the Indian raid of March 1697, offers a corroborative account of the events surrounding the Dustin escape on Contoocook Island. The transcription states that Bradley was shown seven hatchet wounds on the head of the surviving Indian woman who sought refuge in a camp in which Bradley was held. Bradley, herself, survived her long march and captivity. She was later redeemed at Casco Bay (Portland).